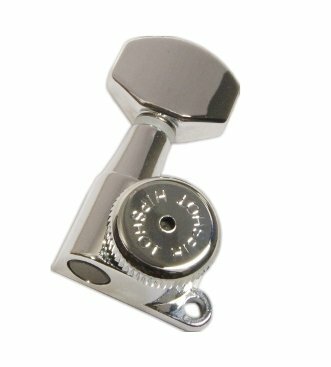 Hipshot 6ELO set of 6 (enclosed gear) Guitar Grip-Locking Tuners posses the precision, craftsmanship and technology you have come to expect. Grip-Lock pin and thumb wheel system clamps onto your string for extra security. 16:1 gear ratio for finer tuning. Mini footprint. Set of 6/Nickel plated. (Gold & Black available , plus Custom colored buttons available/extra-$, email us if desired.) Made In USA.